Today's blog hop is appropriately themed, "Love Is In The Air." Even though my Christmas decorations are still up, I was in the mood to create something that wasn't holiday inspired. So I set to work using whatever hearts I could find in my arsenal! The Perpetual Birthday Calendar set has a cute little cluster of hearts that were perfect to stamp in Real Red ink for a fun background. 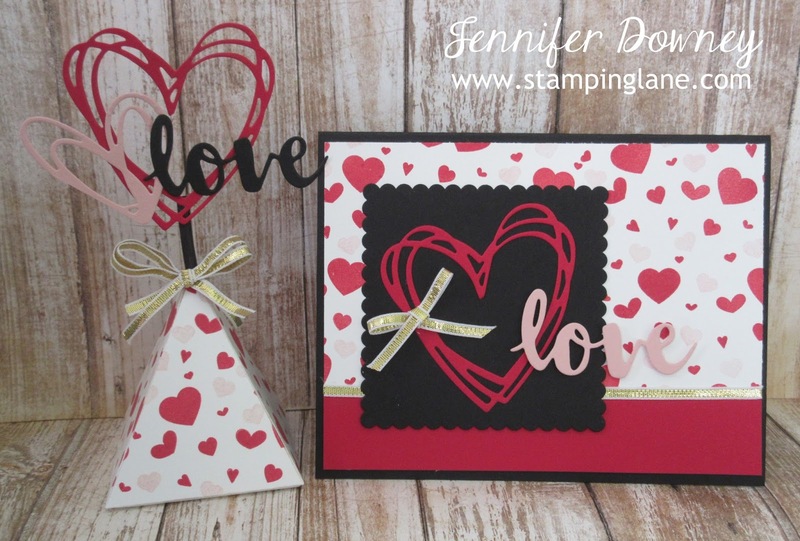 I also stamped the single little heart from the Sweet Home set in Blushing Bride ink to make the background more interesting. The die cut heart and word "love" are from the Sunshine Wishes Thinlet set. Add a strip of our Gold Metallic ribbon and a bow, and you've got a wonderful source of sparkle. 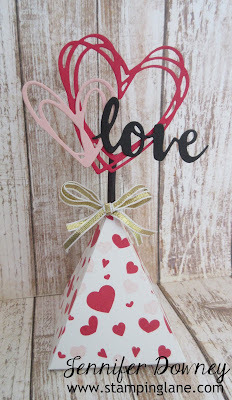 I wanted to create a fun little treat holder to accompany my card so I whipped this little box up in no time using our Pyramid Pals Thinlet Die. I stamped the two colored hearts all over the pieces like I did on the card before assembling the box. Once again, I used the same die cut set to create the two sized hearts and word "love" that I adhered with glue dots to a wooden skewer that I colored black and slipped into the top of the box. To make it really easy to slip it in and out, I snipped about 1/8 of an inch off the top of the completed pyramid. Add a double layered gold metallic bow and voila! you have a fun and easy treat holder. Even though love can be complicated, I didn't want it to be with the projects I shared with you today. I kept them easy and fairly simple so you could spread love on a massive scale if you wanted. I hope you will continue hopping along to see what the other designers created this month. Happy Stamping! Love your Pyramid Pals box! The "topper" really makes it pop. Great projects Jennifer. Love that triangle box. Such a cute party favor or treat box. Great projects! I forget to use those heart framelits - but love your topper with it!